Some insurance agents who have ventured online say it's teeming with leads just waiting to be found. Chris Huntley lived in paradise, but he was not leading a dream life. Although he was in the oasis of perfect weather and beaches that is San Diego, the climate was not as good for his life insurance business. For three years he had gotten his feet wet in the business by selling part-time while holding down another job as a telemarketer. He dived in full time in 2007, just as the Great Recession’s tsunami was building on the horizon. He was paddling hard just to stay afloat when he saw his salvation, the Land of the Long Tail — also known as Internet marketing. 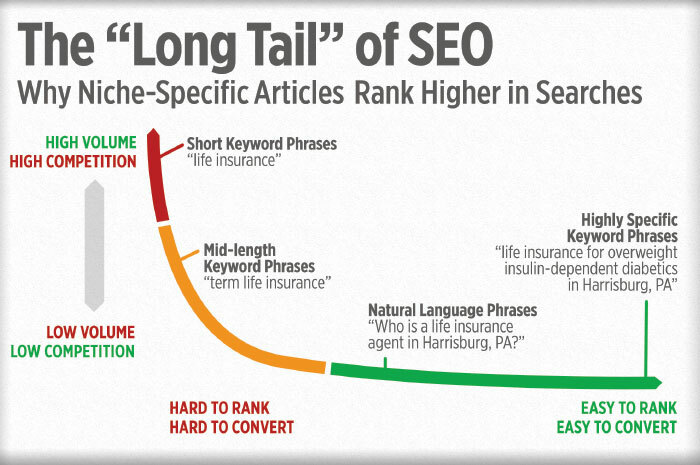 The “long tail” is search engine optimization (SEO) lingo that reveals far more than its definition. More on that later, but suffice it to say that “long tail” captures the essence of how to be a successful life insurance seller on the Internet. How successful? How about going from dreaming of getting 30 leads in a month to actually getting 1,200 a day? How about becoming so wealthy with leads that you have to devise a system to funnel them to a bevy of other agents? How about never having to “work” again unless you want to? That is Huntley’s story. His original website, insuranceblogbychris.com, and a couple of other sites are lead-generating factories that ship leads to a sister insurance agency he started. He doesn’t do any selling himself, but he is looking to help other agents follow his path with eLifeTools.com. Not much about his background would have indicated that he was a natural for Internet marketing. His bachelor’s degree from San Diego State University is in Spanish linguistics. He did a little teaching. He was giving life insurance a try at the behest of a friend, but nothing was catching fire — until an irresistible offer popped up in his email. For $500, Huntley received an e-book and a blank website with a quote form. He was off. He didn’t know exactly where he was going and only vaguely how to get there, but he knew this might be his last best chance to make life insurance selling work. The person who sold Huntley the site and book was a Canadian on a mission. Glenn Cooke had sent an email to 1,000 people promoting his book How My Website Generates 30 Insurance Leads per Month and a WordPress website. About five people had taken him up on the offer and only Huntley followed through with implementing the site. 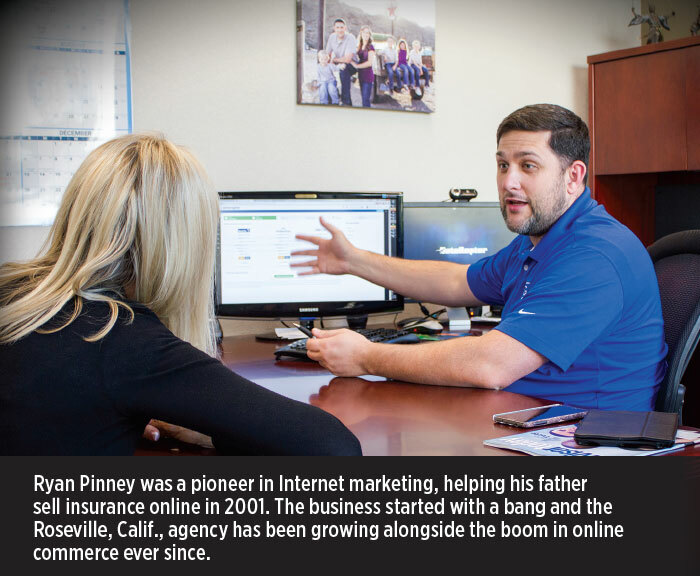 Cooke had believed in what he was doing so much that he left an insurance company in the late 1990s to set up websites for insurance agents. The venture was a melding of previous attempts at a career. He started training as a computer programmer, but that did not work out. He moved to an insurance software company as tech support before he went to an insurance carrier to train as an actuary. It was there that he proposed a plan to provide websites to insurance agents. When the company didn’t go for it, that’s when he went out on his own to do it. 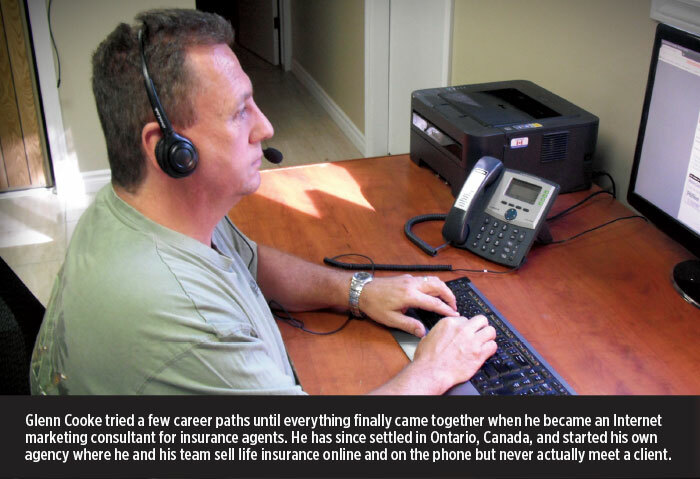 He sold websites, online quoting systems and SEO services to agents in the United States and Canada when he decided to jump into insurance sales himself in his home Canadian market. He owns the agency Life Insurance Canada, where he employs three brokers and an administrative staffer. The paperless business conducts all its interactions with clients online and on the phone, so it doesn’t need a physical office. Cooke is still considered a resource for agents looking to generate business online. His message is still the same, although some of the methods might have changed. Obviously, the first step is to get a website. Although Cooke used to sell a website starter kit, he said it is even easier today to set up a website on WordPress. But if people are uneasy about finding their way about the interface, hire somebody, he said. “You find somebody who does insurance websites, pay them a few bucks and make sure it’s on WordPress,” Cooke said, adding that the provider should understand that the main goal of the site is lead conversion. Although establishing a place on the Internet is easier these days, getting people to visit your website is still not a snap of the fingers. Getting people to visit your site is where marketing comes in. SEO is the art and science of making your site attractive to search engines. For example, if you were in Canada and typed “life insurance” into Google, Cooke’s site would pop up at the top of the list. That means Google valued his content, so its algorithm gave Cooke’s site a high page rank. Then the site gets even more traffic and even more people link to it, perpetuating its high standing. But how do you get that high up in the rankings? That’s the question that spawned a huge SEO industry. Over the years, many methods to gin up a website’s ranking have come and gone. But those with staying power usually attribute it to having content that connects. Quite simply, Google is looking for good information to deliver in its searches. So it is not enough just to have content; the content also must be original. Because insurance agents aren’t professional writers, shouldn’t they just hire somebody to write content for them? That might have worked once, but not anymore. Finding an expert on your subject who also can write well can be an expensive proposition. The people available for hire at an affordable rate are more likely experts at writing, but they must quickly gather facts about your field. And where do they go for those facts? Google, of course. Content must be original as in “really original,” but even that isn’t sufficient. Cooke said he has to remind himself of that in his own writing. So that means agents can add “writer” to their many talents. But how? Anybody who has stared at a blank screen and willed words to appear probably will break out in a sweat thinking about writing enough words to populate an entire website. Huntley was able to build his magic lead-generating machine from his own content. But he also was not sure how to start. He had the guide that Cooke had provided and a website with plenty of empty space awaiting his words. “All I had to do was write articles and somehow get Google to rank me,” Huntley said in an understatement. He turned to the first rule of writing — write what you know. Whenever he ran into something interesting in his practice, he wrote about it and posted it. At first, it came naturally out of his practice, parlaying research he already was doing for clients. After that initial success, he looked at the process from more of a marketing perspective. Huntley became an expert on how to place people with high-risk medical conditions or other pre-existing conditions, and he wrote about them. That is how he eventually ended up with more than 500 articles on his site. Even if the article is not about a niche, he would put as many conditions as possible into a more general article to snag those searches. 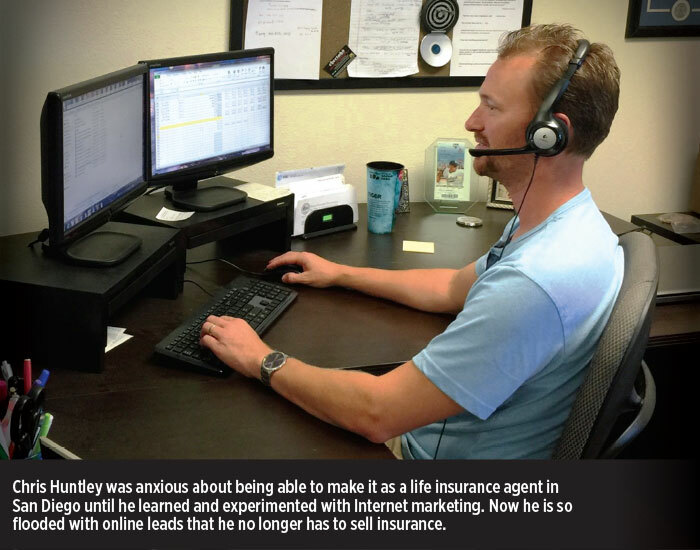 When people hit on Huntley’s site, they usually are ready to talk insurance because all their searching has led to him. “What people don’t realize is 70 percent of people who go to Google are searching for a search term that has never been searched before,” he said, adding that most people start with a very general search and a corresponding result. “They’re probably not really ready to buy because they’re at the beginning of their search,” Huntley explained. “They’re going to find out that if they smoke or they are overweight for their age, it makes a difference. After a couple of searches they might look for something like ‘What does it cost for a 20-year term, half-a-million dollar policy for a 56-year-old smoker?’ That particular term has never been searched for in the history of mankind and that’s where I live.” That address is in the Land of the Long Tail. The long tail in an SEO search graph is the far end of a slope, like a swoop of a bird gliding in for a landing from a very high place. The high, left end of the graph is where a majority of searches go because they are very general. The right, low end of the line is where very few searches go because they are very specific. Cooke described the swoop in terms of life insurance. Good luck trying to rank high on the search term “life insurance” itself on the left end. That’s the province of insurance companies and news sites, such as InsuranceNewsNet. The money is on the right side of the graph. Not only is there little competition in the long tail, there is also quite a bit of traffic. But even if advisors type their fingers bloody writing about all these niches, it is not certain that Google will find them. The algorithm would like to see some social proof. That means getting other websites to link to the material. But the linking should make sense. For example, it would be logical if a website for a Boise, Idaho, cigar shop linked to an article about life insurance for cigar smokers written by a Boise agent. The same would go for an agent who has a general practice to link to an article from another agent about a particular issue. That would be more of an organic link. But many of the tricks of buying links are not working anymore. Google has wised up over the years. Ryan Pinney has seen the tricks come and go in his long career in Internet marketing, which started only a couple of years after Google itself began. They added an agent to their Roseville, Calif., office to handle the requests for applications, but the entire office was overwhelmed when 1,000 requests came in during the first month. “These were people who had gone online, quoted themselves, looked at our product and said, ‘I want to buy this. Send me an application.’ And so, as you can imagine, one person is really hardpressed to fill 1,000 orders,” Pinney said. The office hired more people, and they were off into Internet marketing with a bang. Another skill to learn was SEO. In the early days of Google and less competition online, it was easier to pop up to the top of Page Ranks. Major sites were penalized for a variety of reasons. Some had to do with various tricks such as buying links, because they tended to follow predictable patterns that Google could spot. But local sources with legitimate content were favored in rankings in a triumph for local SEO. Isn’t most of the business off the Internet small term policies where volume is the name of the game? But Pinney said he has seen cases getting bigger as consumers have become accustomed to doing business online. Most of the big cases originating online come from estate-planning clients. Not only do they arrive with big needs, they come ready to buy. Those clients typically need coverage with premiums in the six figures or more. Pinney’s answer to advisors who say they don’t need to be active online is that they have pretty much checked out of the business. “Today, the default answer for everything these days has become ‘Google,’” he said. “If you don’t know the answer, whether it’s an argument or a conversation or a date, it doesn’t matter. Everyone’s answer is to pull out the phone and Google it.” So, if you’re not there, you’re not the answer. I’m online, now where are those leads? Once advisors get active online and build content, they can run into two problems: Visitors don’t convert to actual leads, and many of those leads aren’t very good. The solution for the first problem is site design and the second is the advisors themselves. When Cooke discussed setting up the website, he mentioned that the key goal is lead conversion. But how does the site itself encourage that? 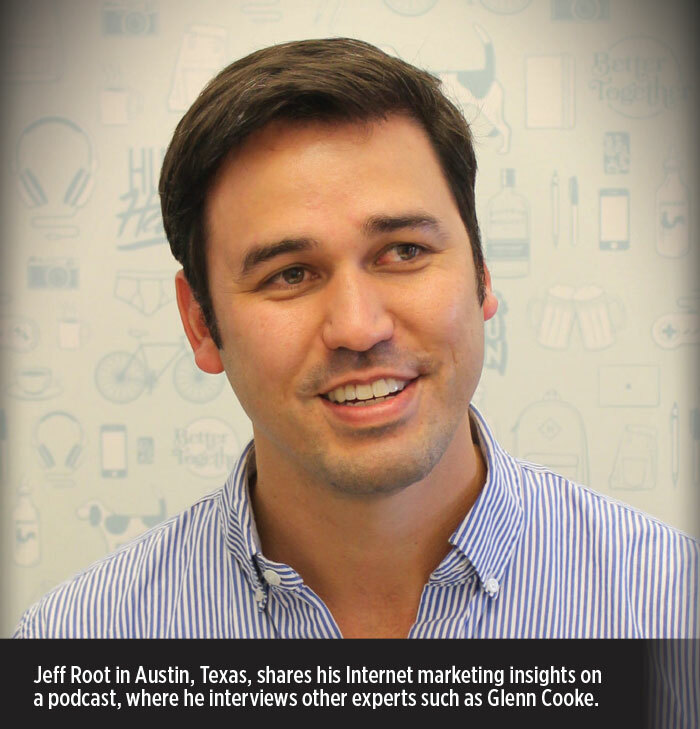 Jeff Root, an independent agent in Austin, built an online business on content and is now helping other agents do the same. He has a following that regularly listen to his podcasts on his site, selltermlife.com, that include other agents who are successful online, such as Cooke. He has found through collected wisdom and testing that emotion captures attention, but a tightly focused funnel captures the lead. For example, Googling “COPD” and “life insurance” will show Root’s site, rootfin.com, as one of the top results. Open it and a poignant image greets the visitor. Scrolling down to the article, the reader will see a photo of a man coughing. But next to that is the key that makes it all work. It’s the call to action, which is an instant quote form. The form remains at the right even as the reader scrolls through the article. The page has very few other actions available. The visitor either will fill out the form or just move on. This structure is consistent with that of many of the agents and advisors who have found success online. Others may have built in additional options for more information for visitors to learn more and perhaps to inspire a purchase. Maybe it’s other articles on the site or a report exploring the subject. The idea in that case is to get visitors involved in the site and use it more as a resource to revisit. But our experts say it doesn’t work that way. Consumers go out looking for an answer, and once they have hunted down a solution, they want to act. But don’t stop there. Test the results. That’s what Root did to perfect what seems like a stone-simple landing page. Another important aspect is that the link brings the visitor to a landing page rather than a home page. “If you’re sending that traffic to your home page, you’re not going to get good results at all,” Root said, explaining that the many options on a home page distract visitors. Root contends that a landing page crafted around the principles he described will convert one out of three visitors into a lead. Even if advisors are not yet generating significant Web traffic, a high-converting website can be an enriching partner to traditional prospecting. Once an effective landing page is set up, it is ready to harvest the fruit of local marketing. Ads on smaller local news sites can pay off if the relatively small number of visitors convert at a high rate. And those leads tend to be strong because they are generally people looking for an advisor they can visit around the corner. But what about the Internet leads? Advisors often complain they can’t ever reach them, and when they do, the consumer is not ready to consume. Each of the experts speaking for this article said they have heard these complaints and have the same answer: You have to work it. Cooke of Life Insurance Canada said the leads are not like a local referral. They require a different approach. First is a sense of perspective about the leads themselves. The Internet leads can outdo the old 10-3-1 formula, but that doesn’t mean it is easy. And he does mean pound. Cooke said he often hears advisors say they have tried the prospect and they aren’t getting back to them, therefore it’s a lousy lead. He said he will often take the same lead and make a sale, but it’s not magic. It’s persistence. Some advisors might feel like that much calling could be considered harassment, but Cooke said it is not like the days of cold-calling where an agent is trying to catch a stranger’s attention during dinnertime. These are people who went on the Internet shopping for insurance and gave their contact information. They know an agent will be calling them. But they are busy with work, kids and all the other distractions in today’s society. Another difference is that traditional sales closes don’t work as well over the phone with these prospects. They are more apt to simply hang up in those cases. Cooke said he asks questions to determine need and makes recommendations. He also assumes that the first call will not close the sale. What are they doing between the first and second calls? They are talking to other agents, sometimes an agent they already have. Cooke said he assumes he is always competing but that he wins out by being the information source who didn’t pressure them once he got the prospect on the phone. Another problem he sees is that some advisors have a call reluctance. They will put the lead aside to call the next day when they are ready. Cooke said they may as well throw that lead away.